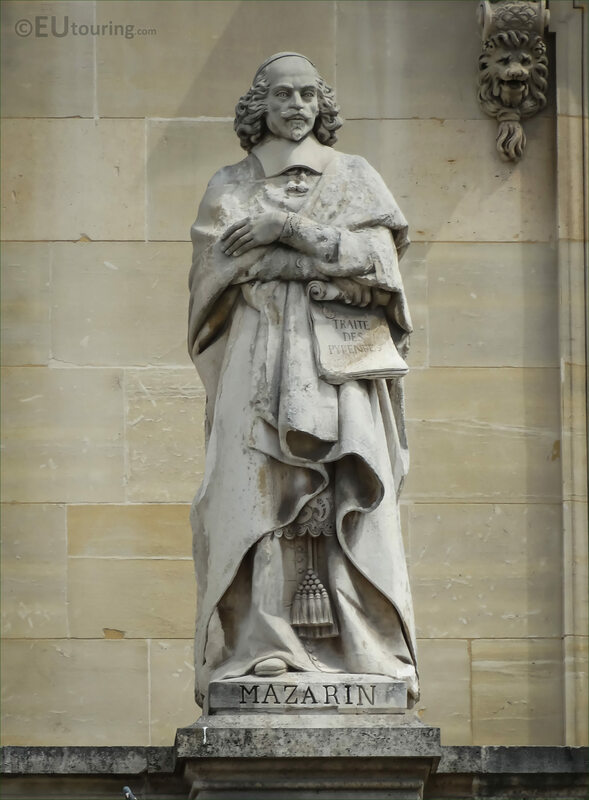 Again, we were admiring all the different statues on the Aile Turgot wing of the Musee du Louvre, which is the famous tourist attraction located in the 1st Arrondissement of Paris, and took these high definition photos showing the statue of Mazarin by Pierre Hebert. Now this first photo shows the statue of Jules Raymond Mazarin, known as Cardinal Mazarin, and as you are looking at the facade of the Aile Turgot from the Cour Napoleon, you will find this positioned on the first level balustrade virtually in the middle, next to the statue of Colbert, fifth from the right hand side. So you will find that this statue was produced by Pierre Hebert, who was born in 1804 and became a French sculptor, yet his son also became a sculptor, and so, he is often referred to as Pierre Hebert the Elder, and as well as this commission for the Palais du Louvre, he also produced another located in the Cour Carree prior to passing away in Paris in 1869. 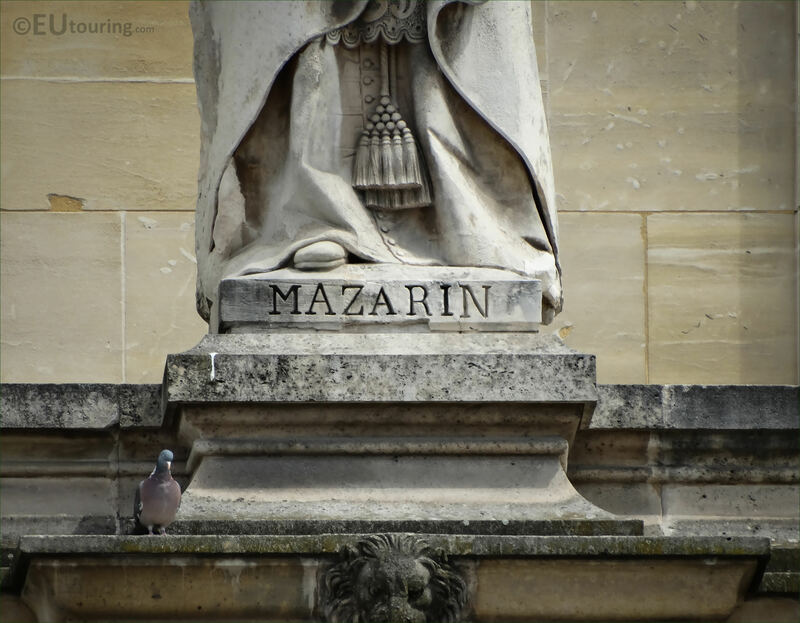 And in this last close up HD photo you can see the base of the statue with the name Mazarin, and he was originally born Giulio Raimondo Mazzarino in 1602, yet was known in French as Jules Raymond Mazarin and later Cardinal Mazarin. Now Cardinal Mazarin was a great bibliophile plus a major collector of jewels and had much wealth, and he served as the Chief Minister of the French King Louis XIII from 1642, then became the co-ruler of France with Anne of Austria, while she was regent for King Louis XIV and he served in these roles until his death in March 1661. 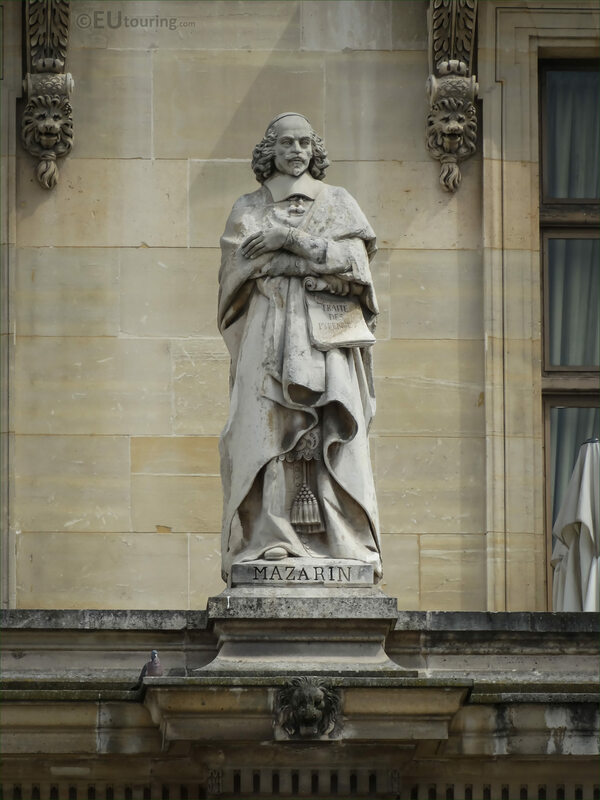 Yet he also left an impressive legacy behind him, founding the College des Quatre-Nations, which is now known as the Institut de France in Paris, and having already opened up his own personal library to scholars, he left the Bibliotheque Mazarin to the college, plus he bequeathed the Mazarin diamonds to King Louis XIV and some of these still remain at the Musee du Louvre.